OTTAWA - Cooked turkey is a central part of many holiday celebrations in Canada - especially Thanksgiving. Health Canada would like to remind all Canadians of some steps they can take to help ensure their turkey feast is a safe one. 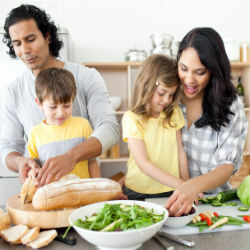 Adopting standard safe cooking and safe handling practices (clean, separate, cook and chill) reduces the risk to yourself and your family of getting sick from undercooked turkey and stuffing and from cross-contamination during preparation. Don't rinse raw turkey. This can spread bacteria everywhere the water splashes, creating a safety hazard. Wash your hands carefully with soap and warm water for at least 20 seconds before and after handling raw poultry and clean and disinfect surfaces and kitchen utensils touched by raw or thawing turkey and its juices. Foods such as fully cooked turkey and potatoes can be eaten cold. Gravy should be reheated to reach a full rolling boil and other leftovers should be reheated to at least 74ºC (165ºF). Turkey poses particular food safety challenges because it can be contaminated with bacteria such as Salmonella, which can cause diarrhea, vomiting and stomach cramps.